What child doesn’t dream of having a pony? 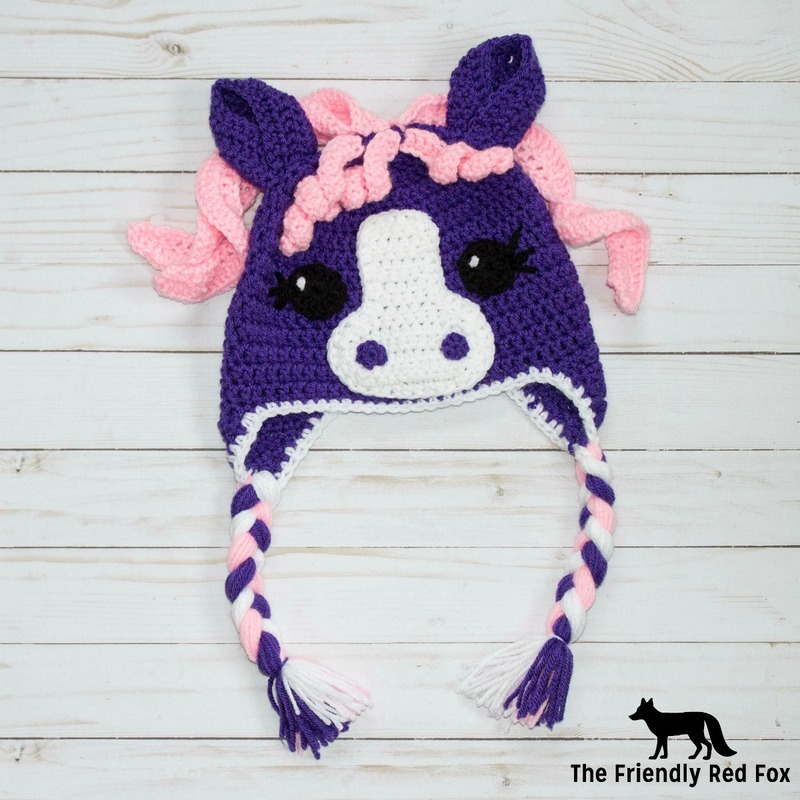 Make them this pony hat and they can BE the pony, and stay warm and look cute at the same time! 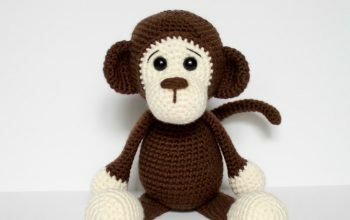 Add it to your Ravelry Queue! You can find an ad-free, printable PDF for a small fee HERE. Stop here for Toddler size. Stop here for Child/Adult size. Crochet around the entire piece. SC for toddler size. HDC for Child/Adult. Fasten off and leave a tail long enough to sew on. In a magic ring, 6 SC. Join, fasten off and leave a tail long enough to sew on your nose. Round 5: DC in each chain around. Fasten off, leaving a tail long enough to sew on. Bring one corner over the other. Sew them together, then attach the hat. See the pictures for each row, and what the front and back should look like. 12 DC in magic circle, join. Leave an extra long tail to sew on and for eyelashes. Sew on little reflection spot with white yarn. 14 DC in magic circle, join. Leave an extra long tail to sew on and for eyelashes. Sew on little reflection spot with white yarn. A few tips on the eyes… When you sew on the eyelashes, determine how long you want it to be and sew down in a loop left by the hat’s pattern. I do two stitches and use the EXACT same holes on both ends to go through. Then do the same for the next three eyelashes. Of course if you are making a boy hat, you can leave the eyelashes off! Chain to the length desired. DC across the length. Chain 2 and turn. Place 2 DC in each stitch across. Fasten off and sew on. For tighter curls, chain to desired length, then add 2 DC in each chain across. To attach the curls to the ear flaps, make two tight curls the same length and attach at the bottom. For help with the ear flaps watch this video. 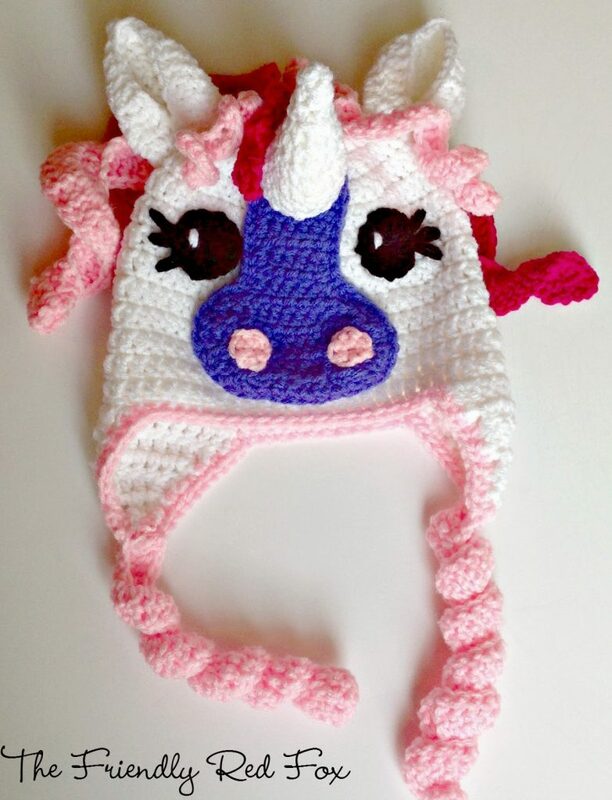 It would be super easy to make this a unicorn hat! I used the horn pattern from Repeat Crafter Me’s blog. 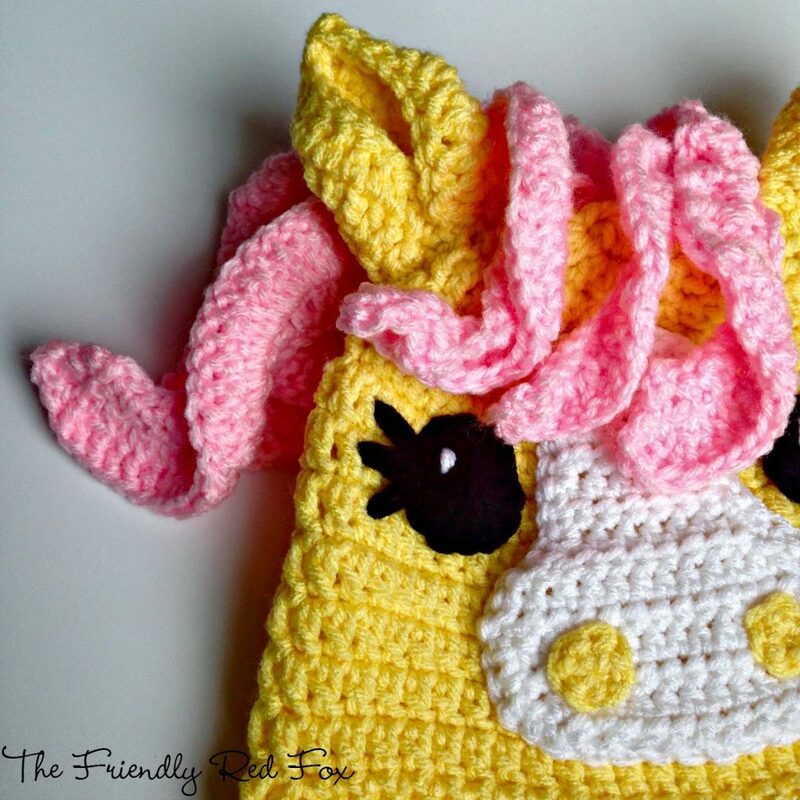 Sara is one of my very favorite crochet bloggers and she has a cute pattern for a different type of unicorn over there! There you have it! 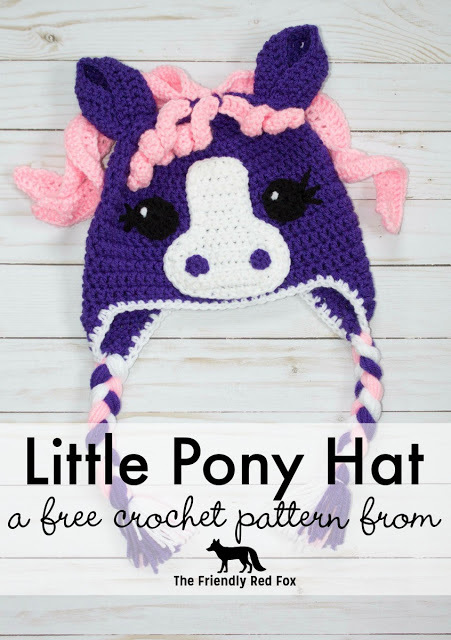 A beautiful crochet pony hat! Remember to post any pics of your creations to my Facebook Page! Or use the hashtag #thefriendlyredfox on instagram! Thank you Connie! So glad you stopped by! Love these hats. Super cute. Please give me an approximate of how many chains you did for the wavy hair. Many thanks, this pattern is adorable. These are sooooooo cute! My daughter would love one of these, so thanks for sharing that pattern. I'm pinning it, and I'd love for you to link up at my Submarine Sunday Link Party! I hope to see you there!! It's hard to give an exact amount because I varied all of the hair pieces. But start with about 12 for the front pieces and 20 for the back! They will come close to the length of the chains. Experiment! That's the fun with this hat, it can be so different! For the ties chain to desired length (about 30, but it depends on what size you are doing) and then put two double crochets in each stitch, fasten off and attach! Oh my goodness, these are too cute! I have a four year old that would LOVE one (or two, or three . . .) of these! Thank you for such a great pattern! ADORABLE hat! Pinned for later! My little cousin is going to LOVE it. Popping over from the Show and Tell Link Party. I did about 7- 3 in the front and 4 in back! Oops you are right! I fixed it for you! 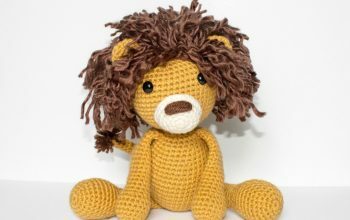 Are you going to update your pattern and put the directions for the wavy hair and the ties so I can print the complete pattern out. Many thanks. 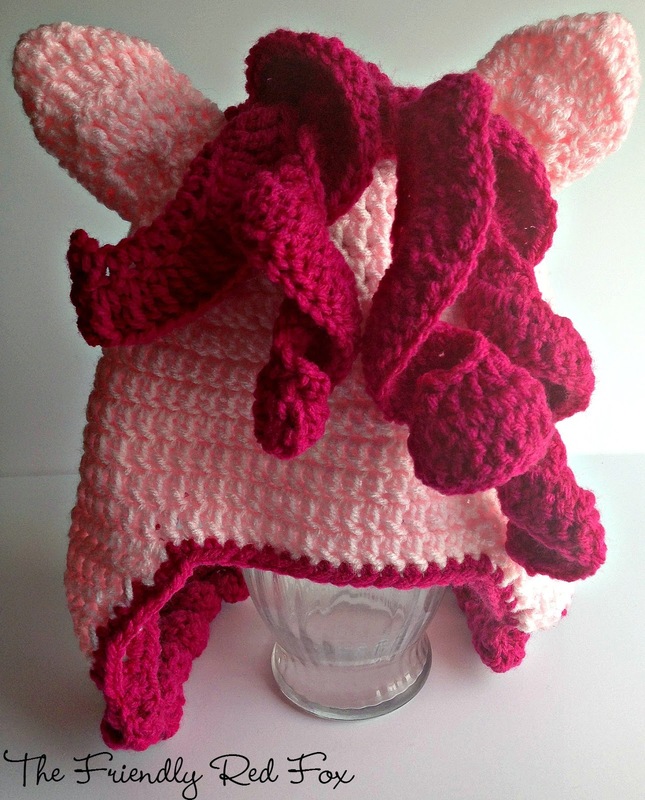 Are we allowed to sell finished items from this pattern as well as the flamingo hat? On the other patterns you leave a disclaimer, do these patterns have the same rules? Thanks the patterns are SUPER cute!!! Yes you are! I will need to write up a policy page, but yes follow the recent disclaimer. I also ask (but definitely do not require!) that you share my page by word of mouth, social media, or pin on pinterest. 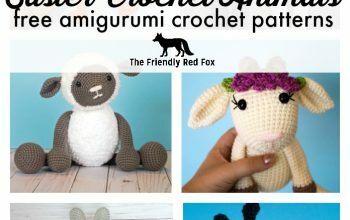 I do provide free patterns but would like to continue to grow my blog! Thank you for asking! I would also love to see any finished items! Help!! I love this hat.. I'm on my second attempt at making it.. I'm trying to make he child size hat, and my number of stitches match yours up until row 5 with 54 dc.. I get 60 dc for row 6 and 66 dc for row 7. I'm not a very experienced crocheter, and my rows are tighter on the first hat.. So my second hat is an attempt with different yarn and an "I" hook.. Am I doing something wrong? I am so glad you shared this with us! I have chosen it as one of my Yarn Favorites, and featured in this weeks Yarn Fanatic Linky Party! #27 is live – http://eyeloveknots.blogspot.com/2015/03/yarn-fanatic-linky-party-27.html. And will also be sharing with my EyeLoveKnots Facebook fans Wednesday afternoon. I hope you will come back and party with us again real soon! I am having problems with ears, have tried both sizes several times and can't get it right. Are you sure those directions are correct?? I am on the ears. My numbers come out wrong. where TR's are there are gaps in the ear. I have 2 many stitches on the 2nd row for what patterns tells me to do on 3rd row. Please let me know what is wrong. that is the pattern that I used, and even though it looks a little wonky laid flat, when you follow the next directions to fold the ears it helps give the point. Then when sewing it on it looks just like the ears in the pictures! Good luck! My daughter is 4. Which size would you recommend for a 4 year old? Toddler or child? I don't want to do all that work to have it be too big or small. She wears a size 4T if that helps. I would go with the child size! With the stripe and nose part? What is troubling you? I would be sure that you are using the right size hook. Thanks, I've got the hat part done and the nose and nostrils. I think you do have the count wrong on rows 7-15 of the child size hat. If you follow the pattern you end up with 66 stitches in those rows, not 64. I did row 7 like 4 times before I gave up and decided it had to be 66 and 2 extra stitches wouldn't hurt one way or the other. lol. Omg…. I just tried it on her. It is huge. It think it would fit me… no clue what I did wrong. Guess I'm starting over with the toddler size. Oh man I am sorry! When I have a little time I will go over it again and make sure there are no errors! I think my daughter may just have a small head lol. 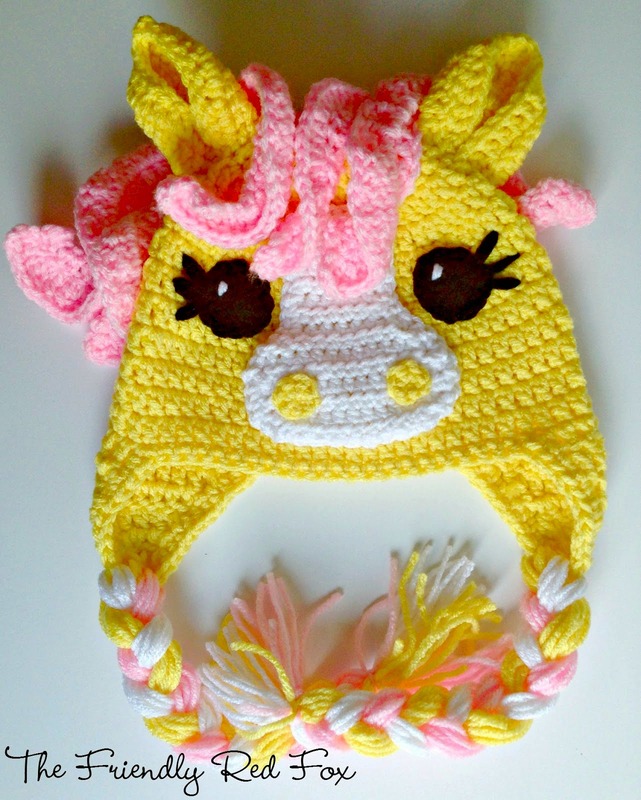 I finished the first one and will give it to my god daughter…. she is 7. I think it may fit her. It is awesomely adorable though. Looking at the patterns and knowing how big this one turned out I may even need to make my daughter the 9-12 months one. Like I said I think she has a tiny head. I am having problems with the Ears, on Row 3 after making DC and TRC as required at the end of the row you have 20 stitches, on Row 4 your asked to make 10 dc 3 trc then 10 dc, this amounts to 23 stitches where have the other 3 come from? 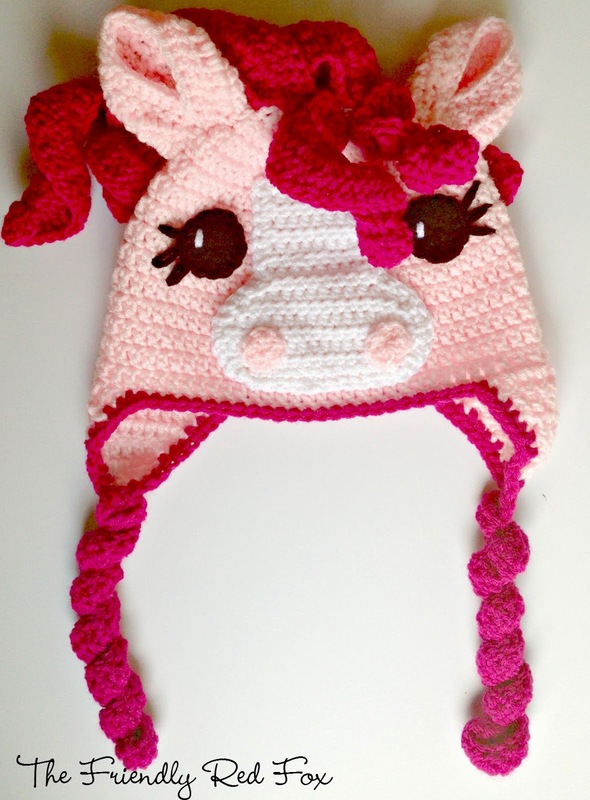 I was wondering if you could give me approximate amounts of yarn used for an adult sized hat? I think there is a miscount on row 3 of the ears. It worked for me to do 5 2DC,(instead of 4)the 3 TC, then 5 2DC, to make 23 stitches and make row 3 end in the right place on row 2. Then row 4 works and the ear looks right to me. Hi. 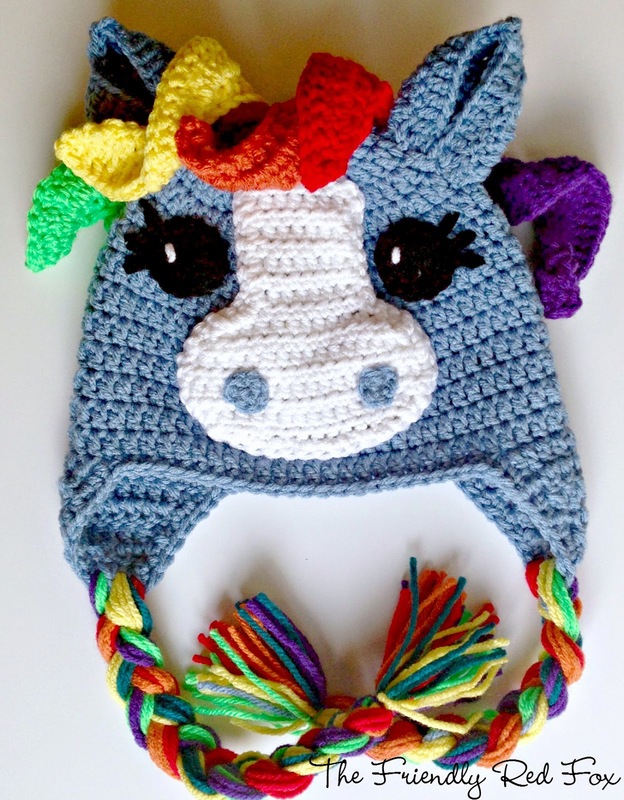 I love your unicorn hat and I"m going to make one. Could you share how you did the ties as they are different than your other ones. Thanks so much! 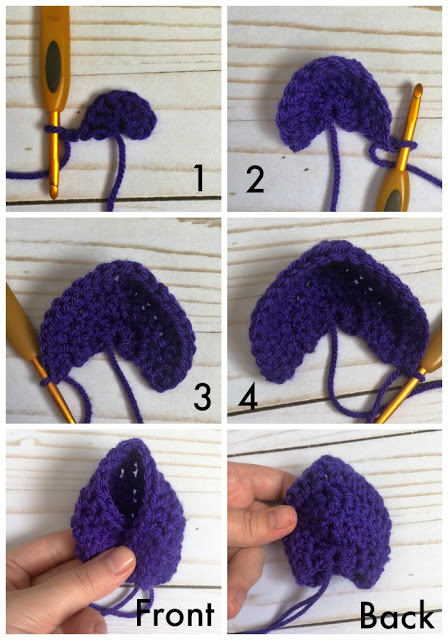 I am working on your pattern and I did the one ear flap but how do i do the second one? Agree. The instructions for the ears are not correct. Will make up my own lol! Such a cute pattern! Thanks for sharing! Can you tell me how to work the ear flaps? Do i join the yarn at a certain point? I'm confused. Tyia! For the child hat row 7 ends up with 66 not 64. Is it suppose to be 66?